Bono is warning that thousands of children are facing hunger as UN agencies confront funding shortfalls. 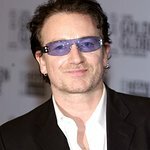 According to an article on the UNHCR website, the lead singer of Irish rock band U2, and co-founder of international campaigning and advocacy group The ONE Campaign, highlighted the needs during a recent visit to displaced men, women and children at a settlement in Maiduguri in Borno state. “There are 50,000 children who are going to die if the UN doesn’t get what they need. This is an extraordinary country, but you can see the people in the north-east struggling — they’ve had their country stolen from them,” Bono said during the visit with Nigerian businessman Alhaji Aliko Dangote. “This is our next door neighbour and if their house catches on fire, our house catches on fire, it’s just that simple,” he added. UN agencies and other NGOs have this year sought nearly US$200 million to meet the immediate needs of more than half a million people forcibly displaced by Boko Haram in Cameroon, Chad and Niger, but currently have less than a quarter – 24 per cent – of the funding they need.